Algonquin Power & Utilities Corp. (AQN): This owner and operator of a portfolio of regulated and non-regulated generation, distribution, and transmission utility assets has seen the Zacks Consensus Estimate for its current year earnings increasing 8.2% over the last 60 days. 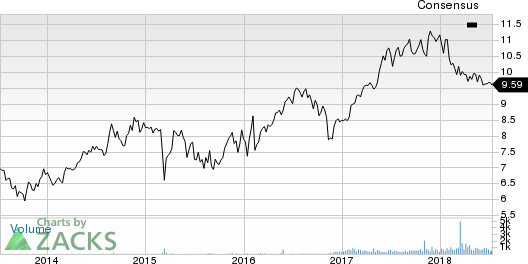 Meritor, Inc. (MTOR): This company that designs, develops, manufactures, markets, distributes, sells, services, and supports integrated systems, modules, and components to original equipment manufacturers has seen the Zacks Consensus Estimate for its current year earnings increasing 1.1% over the last 60 days. PGT Innovations, Inc. (PGTI): This manufacturer and supplier of residential impact-resistant windows and doors has seen the Zacks Consensus Estimate for its current year earnings increasing 1.1% over the last 60 days. BRT Apartments Corp. (BRT): This real estate investment trust has seen the Zacks Consensus Estimate for its current year earnings increasing 15.2% over the last 60 days. Darling Ingredients Inc. (DAR): This company that develops, produces, and sells natural ingredients from edible and inedible bio-nutrients has seen the Zacks Consensus Estimate for its current year earnings increasing 15.3% over the last 60 days.